Hail and Well Met Adventurers! Well the new year is underway and off to the races we go. This past month we've had a few developments that I will cover in this newsletter. As for my project that has pulled me away from the game a bit this month, it is progressing nicely. I'm finally at a place where I'm happy with the direction it is heading. On the Gaiscioch side of the ball, we have our First Quarter Gaiscioch Community Summit on February 3rd at 5PM PT. In addition, we have implemented some changes to our Chapter Structure, begun publishing new landing pages for each chapter, brought the Gaiscioch name and credo back to Elder Scrolls Online, and reopened two classic Gaiscioch chapters as a way of preserving our legacy. Join us on February 3rd at 5PM PT on Twitch.tv, YouTube, or in Discord for this quarter’s Gaiscioch Community Summit as we cover the past 3 months and outline the next three. Please feel free to bring friends to the event along with questions. This event typically runs an hour and will feature highlights from all of our chapters. We've begun unifying our chapters around a new program to keep them open and available to all over the course of time (as best we can). It can be a lot of fun going back to a classic that you fell in love with years ago for a good ol' romp in your old stomping ground. Chapter - 300+ Players - The primary focus of the community. Includes 1 annual grand scale public community event per year. Players have the full features of the Gaiscioch site at their disposal. All games must pass the Compatibility Matrix with a 65% score or higher to become a chapter. Legacy Chapter - 50 - 299 Players - A chapter becomes a Legacy chapter when it crosses 250 active players. Legacy chapters keep their current systems intact and continue to have 1 elder per 50 active players. A Legacy Chapter becomes a full chapter by exceeding 300 active players. Historical Chapter - 1 - 50 Players - These chapters remain open for historical purposes. We like to allow our members the ability to lead events in our classic Gaiscioch chapters if they desire. Historical Chapters function on the same level as Social Adventures and earn social points for attending events. A Historical Chapter becomes a legacy chapter by exceeding 100 active players. The main reasons Historical Chapters function on the social adventure system is due to low population. We feel it's best that members can claim their activity with as little as 1 additional member. Historical Chapters typically do not have the active population to require 4 or more participants. We are however looking at ways to tie attendance to the output of honor points for our leadership and fellowship system so that both systems function similarly. This month I've begun creating several new landing pages for our chapters. While they are not quite 100% where I want them they are getting close. These pages will serve as landing pages we can point our forum posts at to help recruit new members. Each chapter page features a custom introduction to our community, videos, screenshots, feature list, forum posts, game news, Gaiscioch Magazine articles and livestream schedule if available. These hubs will help introduce curious players to our community. In addition I am launching "Potential Chapter" pages to help us measure interest levels in the titles. As always I can not express my gratitude enough to all of those that have supported the community through Patreon, Twitch and YouTube. Your contributions have gone a long way into allowing us to grow and provide us with tools to streamline our operation. Note: I'm working on plugging in the contribution system for Patreons. It will use the total amount donated to push contribution out so fear not all your contributions will be accounted for. I may need to have our Patreons link their Gaiscioch.com account to their Patreon ID to make it all work. I will let you know via email. I want to thank all of you that came out to attend this year's Great Tyrian Adventure. We will begin making plans for the next Great Tyrian Adventure this April. If you would like to be part of the Community Events Team be sure to type "+rank PCE" in Discord chat to toggle the Public Community Events Team rank. We have a long way to go to be ready for next year and the most critical thing we need between now and April is gold. You can send gold to Foghladha.2506 which I will be using to snag Legend, Dusk or Dawn, The Colossus, and Zap off the Trading Post or if you have a precursor you'd like to donate we'll be happy to use whichever ones we have available. Next season I'm hoping to have 4 legendaries to give away and might even go after that map completion myself to finally make one to give away. Both precursors and gold are on the active donation list so feel free to send it over for some contribution points. Congratulations to our Raiding teams who have not only collected enough trophies for 1 additional Gold Trophy in our guild hall, but 2! We now have a total of 3 Gold Trophies sitting in our Guild Hall for all to see. I have created a new monument to our successes so be sure to stop by and check out all the cool trophies we've managed to gather. At launch, ESO had many walls that prevented us from hosting a massive public community event like the Battle for Badlands, Telara Saga or Great Tyrian Adventure. Personal instancing made grouping hard let alone get 50+ people adventuring together. Good news is since launch a lot of these walls have been removed. I've been playing with the idea in my mind of how exactly would we run a PCE in ESO for a while now. How big would our target audience be? Well after a few months, and a lot of thought I feel it's worth a try. So we are scheduling the first chapter of a Public Community Event Series to kick off April 12th at 6PM PT. For this first experiment we are running a shortened series of 5-weeks from our traditional 10-week. If it goes well we will schedule the second chapter of another 5 weeks, and then a 3rd chapter and so on. The First Chapter called "Hroldin's Legacy" will take place in Shadowfen, Deshaan, Stonefalls, The Rift, and Eastmarch. It will focus on Dolmans, World Bosses and the occasional skyshard. Each event will be 1 hour and 30 minutes of adventure and 30 minutes of raffle. People who attend or watch the stream can enter the raffle. Raffle Tiers include Silver (50-100k Value Items), Gold (100-500k Value Items) Platinum (500k-1m value items), and Epic (1m+ value items). Weekly raffles will reward silver and gold items. End of chapter will award gold and platinum with an opt in raffle using attendance tickets for the Epic Prizes. In story we will be a band of adventurers that is searching for Hroldin's artifacts, 3 incredibly powerful relics that led to his unquestioned rule. After learning of a prophecy that spoke of a usurper general that would become king after saving the people of Skyrim from certain doom, Foghladha rallied the troops to find these artifacts. Foghladha believes this would cause Molag Bal's demise and remove his Anchors from Tamriel once and for all. They organize an expedition and set out on a new adventure. My hope is if it succeeds we launch mini PCEs throughout the year. Each would last 5 weeks and focus on a new set of areas and objectives each laced with their own grey area story leading to the rise of Talos some 300 years later. Now typically we spend 6+ months preparing for these events and we're looking at doing it in 3. The hardest part of pulling this off is we don't have a loot vault for the event yet. Over the next 3 months we have to gather as many desirable prizes as we can. I have added several available donations to the ESO chapter to allow people to earn contribution points. This will be a team effort if we are to pull it off. But if we do, it should be a boon to our membership and noticeability in ESO. We will hold a Public Community Event Meeting before the Summit on February 3rd at 2PM PT. All are welcome to attend, especially if you’re an Elder Scrolls Lore junkie! Greetings Everyone! As we move towards unifying our past and present chapters under the Gaiscioch name, we are migrating Elder Scrolls Online from the GSCH guild to the new Gaiscioch guild to share the name with the rest of the chapters. We originally changed our Gaiscioch chapter to GSCH when it became evident that we could not survive and grow in ESO without public recruiting through posting messages in chat channels to recruit new members. As the Gaiscioch Credo prohibits us from spamming chat channels for guild recruitment purposes ("Recruit by Action, Not by Words") we migrated to the GSCH credo which allows such practices. This was instrumental in our survival as the game did not have name plates yet, and no way for people to notice our community. Every player was just a player. Guilds only mattered when they owned guild storefronts and we weren't big enough to maintain an active storefront financially. The good news is now Nameplates are here, and Guilds have more of a face in the world than ever. The key however is that players purchase a Guild Tabard from the Guild Store and wear it so that our guild tag shows above their head. The more people we get to do this, the more noticable our community is. At the end of February we will be emptying out the old GSCH guild and migrating all people and vault items to Gaiscioch. We have already begun the migration for invites to the new guild and are more than half way to getting all our active players over to the new room. I am logging in daily to run my new parser I built which will automatically claim the last character you played on Gaiscioch.com. This also gives me a list of active players who have yet to accept or receive their invites to Gaiscioch. I then built a macro script that runs through the invites. I do this daily so if you have played in the past 45 days you should have an invite waiting for you in game. If you have 5 guilds already the invite will not go through. You will need to drop GSCH to accept the Gaiscioch invite. EVERYONE in Gaiscioch can invite. Please feel free to invite your friends, people who are coming over from GSCH, or new players you stumbled upon in your adventures that would like to join. All we ask is that you don't spam invites on random strangers. We don't want to be "That Guild". Over the past few weeks I've built a mod for ESO that allows me to export guild roster data from the game. This data can then be imported into our website to automatically add, update, and correct your characters into our website. This also has allowed me to migrate the RIFT promotion system to ESO which will allow me to sync in game ranks with Gaiscioch.com roles. So if you’re a Veteran Member out of game you become a Veteran Member in game. Once we have everyone over into "Gaiscioch" from "GSCH" this will help keep our characters updated so there will no longer be a need to add and maintain your character roster. Everything is automatically mapped via your @ESOID. I did notice one thing however. @ESOID's are case sensitive so if you want your characters to sync be sure your ID matches the same case in game. Many of us have been wondering what Trion is up to on the Rift front. Fortunately their new producer’s letter hit right before time to send this. Their letter outlined a few key points coming in 2018. RIFT Prime - a subscription based server that has faster leveling, no cash shop, and unlocks that can be earned instead of bought. Players will additionally be auto-leveled to the content they are playing. A New Warfront - they have a concept picture of it, but that's about all so far. A New Raid Upgrade featuring a "ever hungry" dragon. New PvP Server that features full pvp against everyone outside your guild. RIFTstream – 2018: RIFT ON! For those of you that joined the community in the days of Warhammer Online, no doubt your memories are filled with fun times, tons of laughter, and all kinds of shenanigans. From Oldroar's famous "I got Wood" comments (for door repairs), or Tip & Rianans giving Ice Cream a whole new meaning, or the still famous needle in the haystack. The battles were ferocious and strategic as the Trinity flooded the battlefield. Unfortunately the community took a severe hit after 1.3.6 hit and we ended up closing the chapter to move to Rift. Fortunately for us, long after the demise of Warhammer Online as it stood, a group of fans came together to preserve what we loved in Warhammer for days to come. They launched Return of Reckoning, no-profit a private server with improvements to the original. Currently in alpha stages they are working to reinvent siege combat in Warhammer Online and make it more meaningful. We first launched an excursion back into Warhammer Online about a year ago as a social adventure to test the waters. Unfortunately after a database error our characters and guild were wiped and many people drifted away. Over the past month I took a trip back into Warhammer to get a feel for what they have done and the changes they've made are wonderful. We recreated Gaiscioch in Return of Reckoning and currently have more than 20 players actively playing with us. We continue to grow as we take to the battlefield and I have even scheduled a trial event to see if there is interest in playing. If you would like to join us for some Warhammer Online shenanigans be sure to visit: https://gsch.info/play/ror and get involved. Dark Age of Camelot Goes Free-2-Play This Fall! In preparation of Camelot going free-2-play a few of us are dusting off the cobwebs of our old Gaiscioch na Anu guild (The Original). We have a couple of us currently playing on Ywain 1. We have a high level guild, lots of bounty points to claim castles with and plans for a few events this fall. If your lurking in Hibernia and need some friends hit Foghladha up and get an invite. We're not hugely active but i have a feeling there will be quite a few trying it out this fall. Dark Age of Camelot going Free-2-Play allows us to introduce many first timers to the classic and I for one look forward to bringing another crop of new players through the early battlegrounds into the main Realm vs Realm battlefield. It will also be great for us to get new footage of the community playing Camelot which we couldn't do when we played originally. We are actively looking for PvP Warriors who can lead our family to victory in MU Legend on Sundays between 2 and 4PM PT. MU Legend launched its territory wars system this past month and it's 100% scheduled sieges. We are trying to get a 5 man team that can secure a territory for us through the weekly tournament on Sundays. Owning Territory gives us access to a lot of features as a community that we normally wouldn't have including a place to spend all that contribution we've earned. Unfortunately our core group of players can't play Sundays. So if you're playing MU Legend and want to lead our family to victory please contact Foghladha. We have a few players who will likely be on at that time we just need a leader to get them organized. Are you a fan of Steampunk, Airships, and Siege Warfare? Ascent: Infinite Realm is being created by the team behind Tera and Player Unknown Battlegrounds and is set in a floating world. There is magic, technology, and a ever raging battle over the resources below. We are actively looking at A:IR for Social Adventure inclusion. Take a moment to check out this trailer. If you like what you see cast your vote at: https://www.gaiscioch.com/social/air/ by Joining the Adventure. This is a relatively new development on the horizon and depending on interest levels we may see quite an audience for it. Be sure to let us know if your interested in it. We're in the final weeks of pulling together content for the newest issue. We've already received a few of our exclusive interviews coming this issue and hope to get in the last of them. If you're working on an article be sure to get them in so we can publish on time. 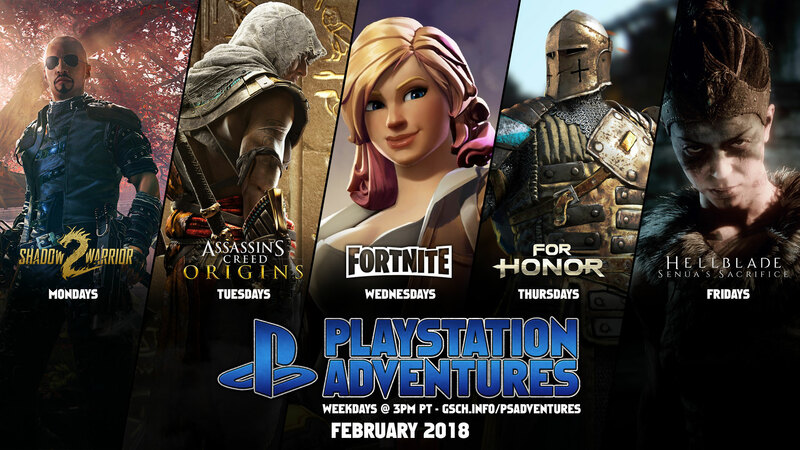 This month Donaliam, Ashes, Radiologikal, Kitty and Foghladha change up the lineup for some new adventures on the PlayStation 4 console.